The southern part of Upper Nidderdale is at the boundary of two geological structures the Askrigg Block and, to the south, the Craven Basin. The boundary is the North Craven Fault system, a complex series of faults, folds and mineral veins. Movements of the system have played an important part in the geological history of the area. During the Variscan mountain building period, at the end of the Carboniferous, and the beginning of the Permian, the rocks were faulted, folded, forming the Greenhow Anticline, and injected with mineral veins, producing deposits of lead (galena), flourite and other minerals. Since the Variscan, for almost 300 million years, the younger rocks have been eroded away, taking with them clues to the events that formed them. At various times during the area’s geological history, uplift of the land and/or a fall in sea-level has exposed the land surface to erosion and/or has interrupted the deposition of sediment resulting in a break in the geological sequence, called an unconformity. 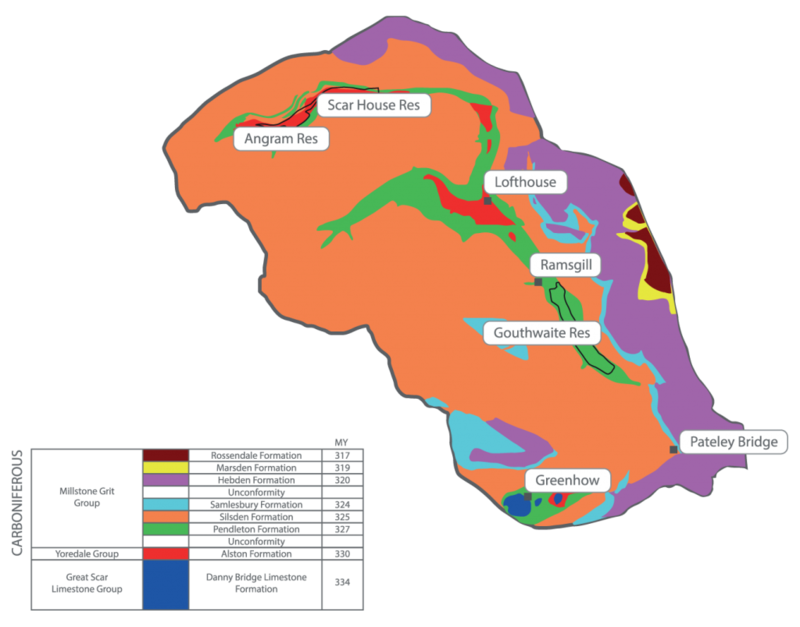 An example is the major unconformity, which occurs between the Yoredale Alston Formation and the Pendleton Formation of the Millstone Grit. The youngest beds of the Alston Formation, together with all of the overlying Stainmore Formation, and the oldest beds of the Pendleton Formation are missing, representing a period of approximately two million years.